The Government's Bank Referral Scheme is designed to help you find an alternative funding solution if you've made an unsuccessful application for bank finance. The banks involved in the scheme are obliged to offer you a referral to one of three designated online 'Finance Platforms' that can provide you with access to a broad range of non-bank lenders - we are one of those platforms. By using our service you have a much better opportunity of finding the right funding that suits your needs. Why can Funding Xchange help when my bank couldn't? Having been declined for a bank loan doesn't mean your business is not fundable. Businesses that have been declined for funding are often attractive to many finance providers who look at creditworthiness in different ways from a bank. For example, a large customer contract in China might seem risky to some - but to funding providers who have access to international trade records, this may be a very attractive proposition. The biggest barrier to accessing non-bank financing is knowing where to turn. With more than 100 alternative finance providers the options seem confusing and understanding who will fund your business and what terms they might offer you can seem daunting. Funding Xchange cuts through this complexity and gives the business owner a simple way of receiving indicative quotes from the finance providers that want to offer you finance. With indicative offers for your business presented in a transparent, easy to understand format, you are in control of choosing the indicative offer that's right for your business. Want to know more about the options available to you? Click here to see our SME Funding Guide, in association with our partners at KPMG Small Business Accounting. What makes Funding Xchange a champion of small businesses? - we ensure lenders come to you to make you indicative offers through Funding Xchange. with Funding Xchange returns you indicative offers from lenders who want to fund your business. of selecting lenders and progressing only if the terms offered suit you. applying to lenders not able to fund you. We only show you indicative offers from lenders who have assessed your request and want to fund you. Lenders compete to provide the best terms - helping you save time and money. How do I apply for funding through Funding Xchange? We make the process easy to understand. You only submit one quick application - it typically takes six minutes. And all lenders, from challenger banks to peer-to-peer and invoice finance providers make offers in a standardised format, so you can directly compare and choose what's right for you. How long does it take until a quote is provided to me? By using Funding Xchange you'll receive indicative quotes for funding. Finance providers make the quotes through Funding Xchange and are not allowed to contact you directly until you decide to proceed with an indicative quote. This puts you in control. Indicative quotes may be provided instantly or can take a few days as finance providers review your application and make customised offers in a standardised format. This ensures that you are receiving accurate indicative quotes that give you confidence on who will provide funding and on what terms. Why is Funding Xchange different? We have built a unique platform that provides indicative offers to you. We'll guide you through the maze of funding options - simplifying the process and providing you with information and tools to make informed funding decisions as you build and grow your business. You'll have the knowledge to make the right decision and once your application has been made, you'll have access to a broad panel of finance providers who actually want to fund you. of sourcing funding. You receive indicative quotes for funding and can see all of the funders that want to provide finance by receiving quotes specific to your funding request. You can control which finance providers are able to view your information. of available funding options and terms. You can decide on the best option using the indicative quotes and easily compare the options in one standardised format. to a range of funding options and solutions no matter what size your business is. We provide access to solutions covering over 80 funding options, some which you may not have thought you were eligible for. You'll see competitive terms offered by funding providers who compete as part of a reverse bidding process.
. It has no impact on your credit score either. How do I know that my business is receiving competitive terms? With Funding Xchange, finance providers compete to offer you the best terms. Indicatives quotes from our panel of 45 lenders are returned in a standardised format allowing you to easily compare and choose the offer that is right for your business. 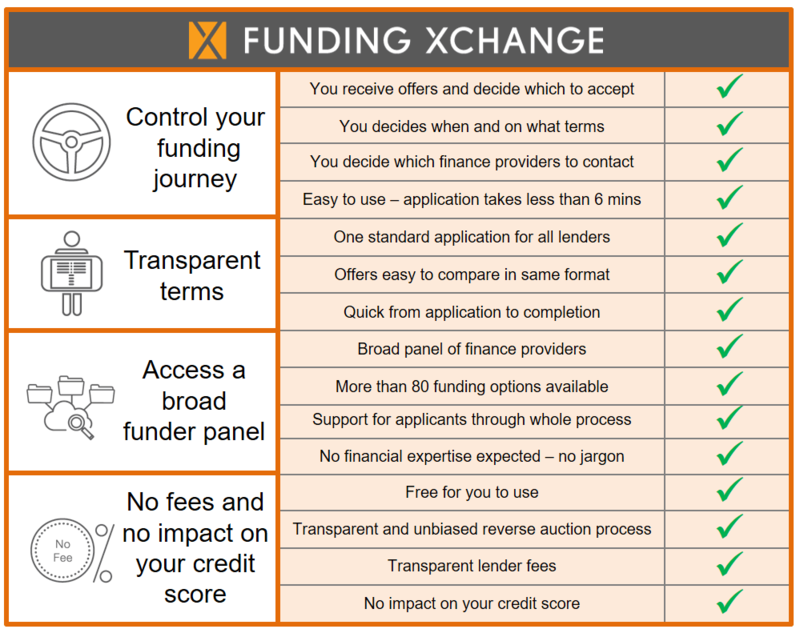 What is the cost of using Funding Xchange and what is the impact on my credit rating? Using Funding Xchange is free for the business. We charge finance providers a commission when a loan agreement has been agreed. Applying through Funding Xchange has no impact on your credit scores. What options for funding do you provide? 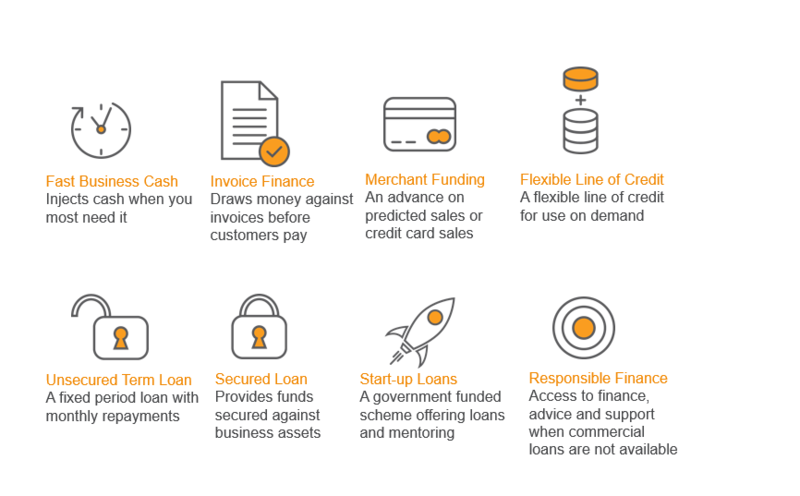 There has been a lot of innovation in new lending products; they give businesses like yours access to finance in many different ways, allowing you to find funding solutions that match your needs and provide the flexibility your business requires. Find out more about the solutions we offer. How much work is it to apply through Funding Xchange? You only submit one quick application - it typically takes six minutes - and all finance providers make offers in a standardised format, so you can directly compare and choose what's right for you. To apply for an indicative quote you don't need to provide detailed financials on your business. How do you ensure my data is kept safe? We take data protection very seriously. We have strong, secure data protection systems in place that are regularly tested. We only use your data for the reasons of seeking finance for your business and will never provide your data to third parties for marketing purposes.